Union sous chef, Cassy Pugh, and general manager, Francis Castagnetti, Jr. 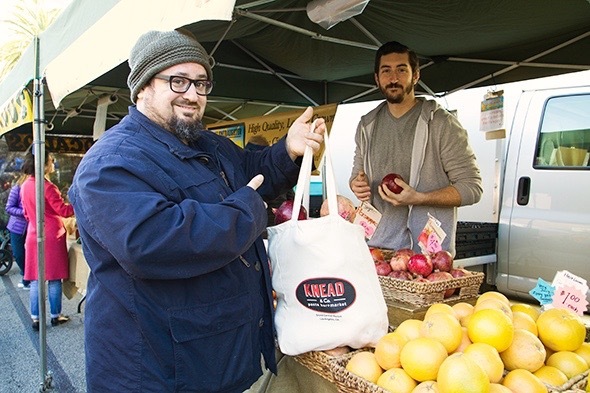 This week at the Santa Monica Farmers Market, we met up with Chef Bruce Kalman of Union in Pasadena and Knead & Co., his brand new pasta bar and market that’s slated to open in Downtown LA’s Grand Central Market on January 11. Among other things, we found him shopping this week for pomegranates from JJ’s Lone Daughter Ranch. 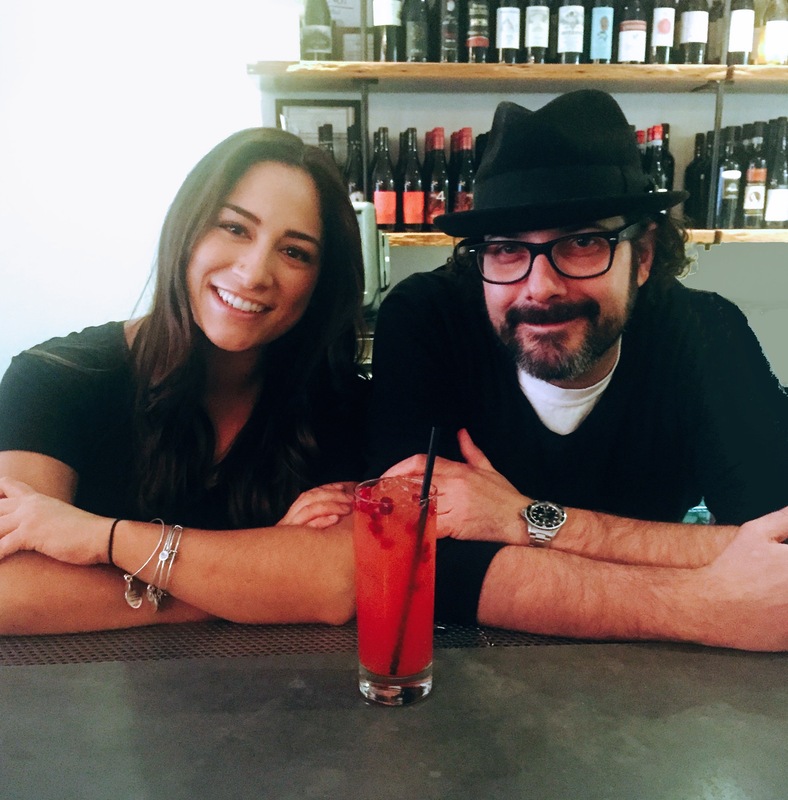 Combining the best of this season’s fruit, his sous chef, Cassy Pugh, and general manager, Francis Castagnetti, Jr., have come up with a freshly squeezed Pomegranate-Orange Italian Soda that is a must-try at Union. While everyone might have his or her own technique for deseeding pomegranates, Bruce begins by slicing them in half. Then, holding one cut-half so that it’s facing down into a bowl, he taps the back of the pomegranate with a wooden spoon until the seeds fall directly into the bowl. Some suggest using a bowl of water to avoid staining your hands while gathering the seeds, but Bruce prefers not to. Instead he picks out the white pith so as not to lose any of the essential pomegranate oils. He then blends the arils in a Vitamix and strains the mixture through a cheesecloth-lined sieve, which he reduces to create a pomegranate syrup for the soda’s base. Take a highball glass and fill it with ice. Combine the simple syrup, orange and pomegranate juices in the glass. Then top with soda water. Roll the contents of the glass into a Boston shaker. Finally, simply pour the contents of the shaker back into the glass and garnish with pomegranate seeds. In a medium-sized sauce pot, combine the water and sugar and set to high heat. Peel the rinds from both Valencia oranges. Add the rinds to the pot and bring the mixture to a boil. Allow the mixture to boil until the sugar is fully dissolved. Then remove the post from heat and let the syrup cool.